What do apostrophes do? They show possession (e.g., Bonnie’s son; the dog’s bone). Perhaps you thought apostrophes did only this one trick, but they have at least one more role. Let’s learn about it by looking at a catchphrase from the 1976 film Taxi Driver. Did you see the film? Even if you didn’t, you’ve probably heard people quoting the famous line delivered by Robert De Niro’s character: “You talkin’ to me?” This phrase demonstrates another function of apostrophes. They indicate the omission of a letter or a number. In that line, the apostrophe stands for the letter G of talking. Keeping in mind that an apostrophe signifies omission, read the following excerpt from Christopher Marlowe’s Edward II. Do you intuit a missing person or thing? Second Lord: Thus, madam, ’tis the king’s will you shall hence. Queen Isabelle: He hath forgotten me; stay, I am his mother. Second Lord: That boots not; therefore, gentle madam, go. Queen Isabelle: Then come, sweet death, and rid me of this grief. In this scene, Queen Isabelle directly addresses death. Since death is not a person or thing that is literally present, you can view it as missing, like the G of talkin’! Interestingly, the word apostrophe comes from a Greek term meaning “turning away.” So, in poetry, an apostrophe is not a punctuation mark. Instead, it is a literary device that helps the writer accomplish a goal. As in the example above, one of the speakers turns away from addressing another character or the audience and instead addresses a third party. In poetry, the party is often an abstract concept such as love, hate, or freedom. Writers might direct speech to a person who is physically absent or deceased. They might even address an inanimate object or a place. Woolly mammoth, Big Behemoth Prehistoric pachyderm, What did you in, You hairy hulk? A teeny tiny Infinitesimal Microscopic Deadly germ? A minuscule bacterium? Hmmm? O world, I cannot hold thee close enough! Thy winds, thy wide grey skies! Thy mists, that roll and rise! Why do poets use this literary device? One reason is to highlight the importance of the idea or object. It also adds drama, evoking emotions from jubilation to sorrow. Reference.com brings out this point: “The effect of an apostrophe in poetry is to personify or bring to life something not living, so the poet is able to address it directly. This puts the subject in a form to which the reader relates.” Is there an idea that particularly moves you? Have you experienced strong emotion? You may consider expressing your feelings in an apostrophe poem. Apostrophes are not one-trick ponies. Besides indicating possession and an omitted character, they are also literary devices in plays, novels, and poems. 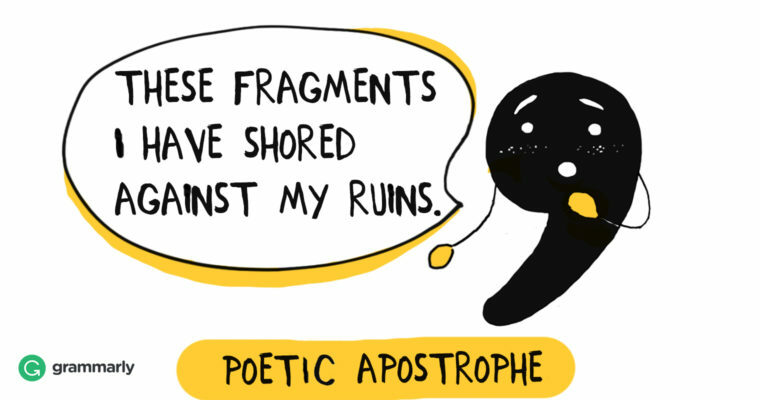 When poets direct speech to an abstract concept or a person who is not physically present, they’re writing apostrophe poetry. O apostrophe, how amazing you are!